Not content to be a standard black business appliance, the Toshiba NB520-10U wants to be the life and soul of the party. It's cooler and louder than the Asus Eee PC and one of the best netbooks worth owning. The Toshiba comes in a choice of colours; green, blue or brown. Your chosen hue extends to the lid, mouse buttons and speaker edging while the rest of the chassis is solid black. The textured rubber of the lid is pleasant to touch and won't get covered in grubby fingerprints. There's no flex to be found around the chassis and the netbook is easily light enough to carry around without a problem. There's also a little extra bulk given to the battery compartment so, when open, the netbook is slightly raised at the back giving you a nice typing angle to work with. The only minor gripes we had with the design was a particularly thick bezel and an awkwardly placed power button that's nestled in the hinge below the centre of the screen. These are some tiny niggles but overall the design of the Toshiba is catching and stylish with a Converse-cool kind of appeal. Of course, most noticeable are the twin speakers built into the palm rest. They've been developed with Harman/Kardon technology and will reach a genuinely impressive volume for a netbook. We were also impressed with the bass we could get out of it. If you want to work with this netbook then using the keyboard isn't immediately intuitive as it's packed pretty tightly into the chassis. Frankly, we preferred typing on the Acer Aspire One or Asus Eee PC, but anyone using this netbook regularly will adapt to the feeling of the keys quickly. The touchpad is neither too responsive nor sluggish and is positioned well – you can use your thumb without your fingers leaving the keyboard. Although, being a netbook, it's a little on the small side. The standard Intel Atom processor, 1GB RAM and Windows 7 Starter OS means this won't rival a laptop for performance. But if you want to browse the web and type out an email while streaming some music, you won't have any problems here. On top of that, the battery life is exemplary. By far and away the most important feature for a netbook, Toshiba has ensured you won't need to regularly charge and the NB520 lasted for 220 minutes under our barrage of tests. 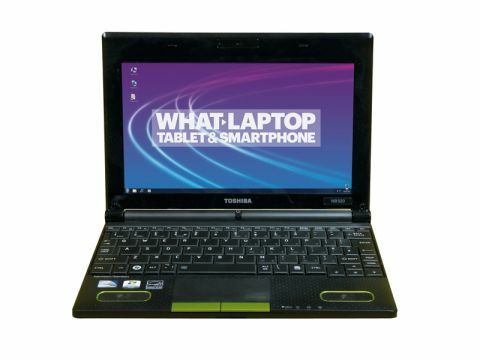 Toshiba has thrown some nice features into the NB520 to make it an even better choice for a netbook purchase. Plug an MP3 player into the USB port and you can use the Toshiba's speakers to play your music, even when the machine is in standby or switched off.